Start sawing logs into lumber with the compact, economical LT15START portable sawmill! Engineered for sawyers looking for an American-made sawmill that is low cost, highly durable, and saws accurately, the LT15START is a member of the popular LT15 sawmill series that is known throughout the world for its quality, versatility and affordability. Loaded and turned manually with a cant hook, logs are secured onto the bed by four adjustable side supports, and one fully adjustable log clamp that tightly fastens the log and allow for cuts within 1” of the bed. To prepare for cutting, saw head height is positioned by a quick turn of the up/down dial that moves 1” for each full rotation or 1/16” for each notch. Once the blade is effortlessly engaged with a handle, cutting is accomplished by steadily pushing the saw head along the length of the log by using a no-maintenance push feed bar. Once the cut is completed, the head is raised up, pulled back, and lowered into position for the next cut. 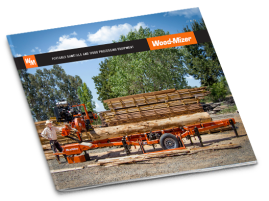 The LT15START sawmill ships on single pallet, comes with one Wood-Mizer sawmill blade, and requires minimal assembly time so you can start sawing within a few hours of receiving your mill. 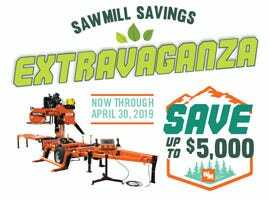 With a 30-day money back guarantee and a 2-year sawmill warranty, the LT15START sawmill is backed by the same level of service, quality and safety features shared by the entire family of Wood-Mizer wood processing equipment.